We're looking for a bench jeweler to join our team in New York City! Emilie Shapiro Contemporary Metals is handmade jewelry company based in Long Island City, NYC, just minutes from midtown Manhattan. Emilie's collection features recycled metals and natural gemstones and is sold worldwide at galleries, small boutiques and museums such as Anthropologie, Sundance and the Smithsonian Museum. 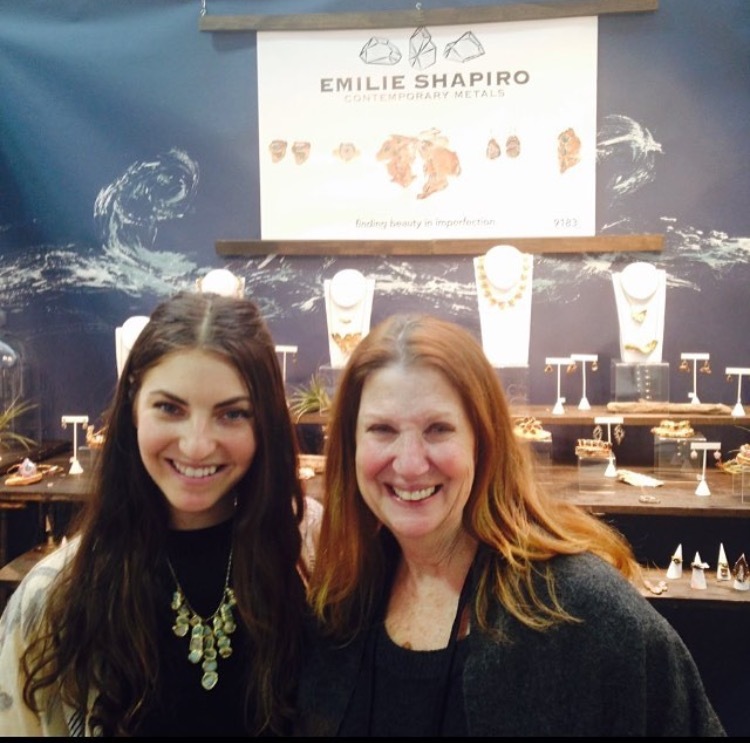 Emilie Shapiro is looking for a bench jeweler to join their growing team. The ideal candidate has basic bench skills including the use of hand tools, sawing, flex shaft use, assembly, soldering and polishing. We are looking for the right fit, not necessarily the most experienced and will train this person with our unique studio practices. The position will entail, but not limited to, cleaning castings, metal fabrication, assembly, soldering, arc welding, stone setting and polishing. The ideal candidate has basic bench skills, a passion for handmade and is looking to learn and grow with the company longterm. This position is a full time position and looking for someone to start immediately. Compensation based on experience. Please submit your resume, a short description of why you're the ideal candidate and images of any past work. Please submit inquiries to info@emilieshapiro.com with the subject "bench jeweler"
Check out this beautiful spread in Charleston Magazine this month featuring the mosaic wide cuff with raw emeralds embedded in brass. Thanks to one of our retailers, Out of Hand in Mt. Pleasant, South Carolina for putting this shoot together! Emilie Shapiro Contemporary Metals is a handmade jewelry company located in New York City inspired from natural elements and celebrating the beauty in imperfections. Emilie Shapiro is committed to sustainability in both material sourcing and studio practices, and all jewelry fabrication is done in house from concept, design to fabrication. Overview: Seeking a creative individual who is highly motivated and organized to assist in all administrative tasks that go into running a small craft company for 1-2 days a week. This individual will work directly with designer and production manager in maintaining and implementing a marketing strategy including social media strategy and marketing emails. This may also entail editing photographs, maintaining company website and online shop, and administrative tasks involved in current and prospective wholesale accounts. This individual will work be working in a creative environment and experience all the moving parts of a small handmade jewelry company. This is a great experience for someone looking to gain marketing and administration experience in a creative environment. The ideal candidate would have a love for jewelry, crafts and handmade products with an eagerness to learn, outgoing personality and work with a fast growing company. This is an unpaid internship with a travel and lunch stipend. School credit is available if applicable. This is not a design or bench jeweler position. We are seeking a bench jeweler to join our growing family! If you, or anyone you know may be interested please pass this along. Emilie Shapiro Contemporary Metals is handmade jewelry company based in Long Island City, NYC, just minutes from midtown Manhattan. Emilie’s collection features recycled metals and natural gemstones and is sold worldwide at galleries, small boutiques and museums such as Anthropologie, Sundance and the Smithsonian Museum. 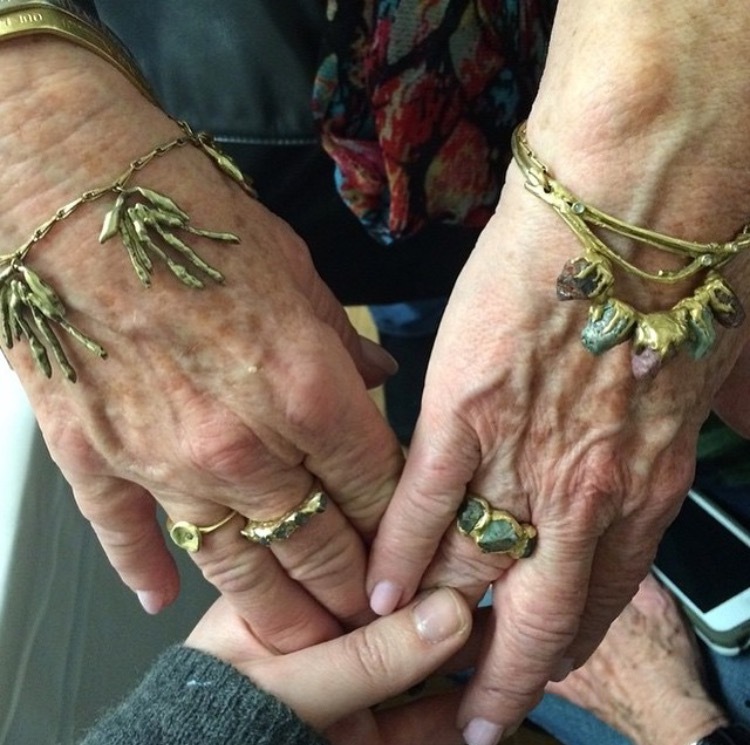 Emilie Shapiro is looking for a bench jeweler to join their growing team. The ideal candidate has basic bench skills including the use of hand tools, sawing, flex shaft use, soldering and polishing. We are looking for the right fit and will train this person during the apprentice program, not necessarily the most experienced. The position will entail, but not limited to, cleaning castings, metal fabrication, assembly, soldering, arc welding and polishing. The ideal candidate has a passion for handmade and is looking to learn and grow with the company. This position is a three month paid apprenticeship that will transition into a full time roll. Compensation based on experience. I recently made this custom engagement ring for a super sweet and newly engaged couple, Casey & Austen. This ring features a rose cut deep green tourmaline surrounded by a halo of rough diamonds embedded in recycled 14k yellow gold. I selected a few different stone options, but Casey picked this stunning rose cut tourmaline that has a really magical iridescence! The finished product basking in the morning studio light. The finished ring features a rose cut, deep green tourmaline surrounded by a halo of rough diamonds embedded in recycled 14k yellow gold. A final look before we sent finished ring off. She said yes! Congratulations to Casey and Austen! We're having an online sample sale! Click here to shop from March 1st - 7th. 100% of the profits will be donated to Cycle for Survival: a fundraising event for innovative studies and clinical trials that are accelerating progress in the fight against rare cancers at Memorial Sloan Kettering. To learn more about the event click here. These are discontinued, studio samples or pieces with a small blemish looking for a home. All pieces are sold as is and are final sale. My brother in law Jon passed away almost 3 years ago from a rare cancer. He was an incredible husband, father, brother, son and friend. He was so supportive of me and my business, some of favorite memories are designing special pieces of jewelry for my sister with him. Unfortunately, I know many people have a story like this and everyone has a loved one affected by cancer. 100% of all profits will be donated to Memorial Sloan Kettering for research for rare cancers from our online sample sale March 1 - March 7. With Valentine's Day right around the corner, I try to remember to spread love everyday. I really believe kindness is contagious, even if it's simply smiling at a stranger on the subway - it's a chain reaction. Here are some of my favorite love inspired pieces to gift a little sparkle for someone special... or yourself! In the late Summer, my sister's boyfriend came to my studio and asked me to create an engagement ring for her! I was so excited that he was planning on asking her to marry him, but also so honored that he asked me to make the ring. Luckily my sister had shown me a ring she loved a few months back that was a vintage ring from the 1920's which I modeled my design after. 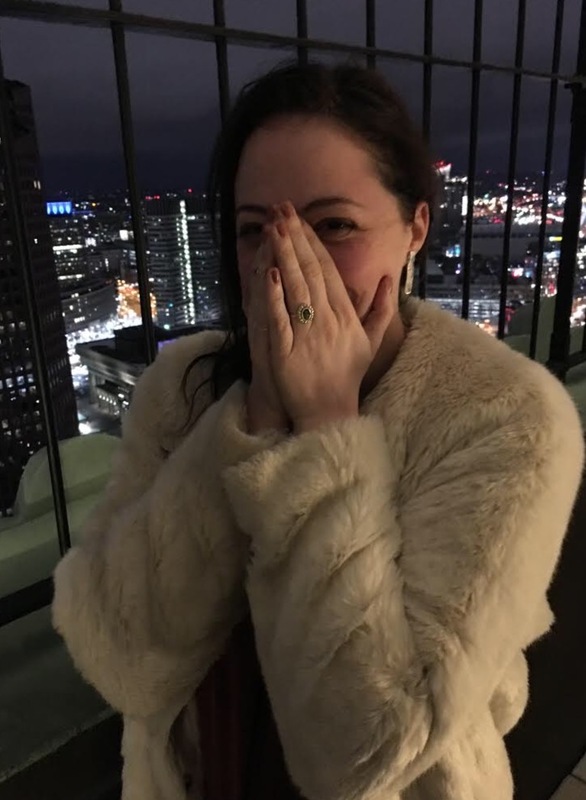 It was so fun and special to make this ring for her and really get to know her boyfriend during the process. Since I don't normally make work like this, it was also really nice to shake things up and step outside of my comfort zone and challenge myself as a designer. The hardest part of working on this project was keeping this secret from my sister and whole family for 2 months! Luckily, my other sister Steph also knew so we could talk about it with each other without imploding with excitement. Derek asked Alli to marry to him this past Saturday, October 29 at our family's house in Montauk. Montauk is such a special place to my whole family and we've been going there since we were kids. That spot is especially meaningful to me since my husband and I were married on that beach last year! It's definitely filled with lots of love. See the step-by-step of how I created Alli's engagement ring below. To create the model for the ring which will eventually be cast into platinum, I start with hard jewelry wax. Here is the beginning of the band. The first step to creating the setting is making a perfect shape seat for the stone. I used a square template to create the octogan shape for the outside of the setting. The ring is inspired by a 1920s setting - the circle inside of an octogan is very Art Deco and was used in jewelry a lot. The octogan setting is carved with a channel for sapphires to surround the stone. The underside of the setting is angled to continue the Art Deco feel. Each window was also hollowed out to let light come through and to bring down the weight of the model. The band is attached to the setting using heat to mend the waxes together. The diamond is just resting on the setting, just in the photo for emphasis! A leaf shape is added to either side of the setting - once in metal accent diamonds will be set in these. One more image of the finished wax model! Next this model goes to a casting house to get cast into platinum using the lost wax casting technique. Here is the raw platinum casting of my wax model. You can see the extra metal on the top of the setting - this is called a sprue. A sprue acts as a passageway for the molten metal during the casting process. Next I will saw the sprue off and sand the entire ring rid of scratches until it's smooth. A side view of the raw casting. The casting has been finished and a channel for the sapphires has been opened up in the metal. Next, the ring goes to a stone cutter who specially cuts the sapphires to fit into the channel. Sapphires have been cut - here I begin to lay them into place to make sure the fit is just right. One last stone to set! Small beads were raised to set each stone which is called "millgrain" - this is a very traditional way of setting stones and gives that vintage feel. The finished ring! All the stones are set and the final polish has been applied to the ring. A side view of the finished product. The ring features a 1.31 carat round brilliant diamond surrounded by 8 trapezoid shaped sapphires in a calibre style octogan setting. 2 diamonds are set in either side of the ring into leaf shapes set in recycled platinum. A picture of the newly engaged couple right after he proposed on the beach in Montauk, NY this past weekend. I'm so happy for my sister and soon to be brother! Fierce Female Giveaway! To us, Mother's Day doesn't necessarily have to be about the woman you call "Mom." Sources of love, strength and inspiration can come from female role models of all types. Tell us a story about a woman who inspires you! For a chance to win this Frozen Fire Trio Necklace with labradorites embedded in brass: post your story, follow & tag@emilieshapirojewelry, hashtag#FierceFemaleGiveaway on instagram or facebook by Monday, May 2nd at midnight EST. Winner will be picked at random. To us, Mother's Day doesn't necessarily have to be about the woman you call "Mom". Sources of love, strength and inspiration can come from female role models of all types. Let's celebrate the Mother's in our life! Our team is growing! We are seeking a part-time operations manager who is looking to be part of something exciting and grow with us. Overview: Seeking a creative individual who is highly motivated and organized to assist in all administrative tasks that go into running a small craft company for 2+ days a week. This individual will be responsible for but not limited to processing orders, packing and shipping wholesale and retail orders, and communicating with current and potential wholesale accounts. Experience with excel, squarespace and photoshop are a huge plus but not required. The ideal candidate would have a love for jewelry, crafts and handmade goods with an eagerness to learn, outgoing personality and work with a fast growing company. We are looking for someone who is excited to be part of a team of creative individuals and looking to grow with the company. The water is our constant. From calming lakes to flowing rivers to fierce oceans - the ebb and flow of water parallels us. Check out these absolutely breathtaking shots by photographer Cadence Kennedy featured in Artfully Wed.
Join us at Renegade this weekend! Renegade Craft Fair, November 14th + 15th @ the Metropolitan Pavilion, 11am - 6pm. Booth No. 153! Overview: Seeking a creative individual who is highly motivated and organized to assist in all administrative tasks that go into running a small craft company for 2 days a week. This individual will be responsible but not limited to editing photographs, maintaining company website and online shop, and administrative tasks involved in current and prospective wholesale accounts. This individual will work directly with the designer and also be helping at wholesale trade shows and other sales events. The ideal candidate would have a love for jewelry, crafts and handmade goods with an eagerness to learn, outgoing personality and work with a fast growing company. This is an unpaid internship with a lunch and travel stipend and / or college credit if applicable. This is not a design or bench jeweler position.